Wouldn’t it be great to eat from your garden every day of the year? That’s the idea behind my newest book, Homegrown Pantry. Over 50 food crops are covered from both gardening and kitchen angles -- the start of many great adventures in homegrown food. Please see my Homegrown Pantry page for more information and some sweet advance reviews. I am proud to announce that Homegrown Pantry won a Silver Award of Achievement from the Garden Writers Association, and second place Silver in the INDIES Book of the Year competition! Houseplants make life better, especially during the cold, dark days of winter. Don't believe me? Buy yourself a dainty little African violet, or maybe a shamrock or prayer plant, and live with it for a couple of weeks. Bonds will form that will increase your awareness of time, light, temperature, even the movement of air. Houseplants make wonderful companions, especially when you find species you like. Of course, it is important not to kill them, which will never happen if you give your houseplants basic care and attend to any special needs they may have. Houseplants come from all over the world, and troubled ones often respond dramatically when their growing conditions are tweaked to resemble those in their ancestral homes. 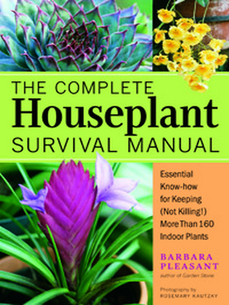 To learn more about this beautiful indoor gardening book that covers more than 160 plants, please see my Houseplant Survival Manual information page. To learn more about pretty prayer plants, see my Maranta information page for tips and trivia. After getting to know thousands of gardeners, I conclude that many people must keep a garden in order to live a happy life. If you find yourself daydreaming about growing juicy tomatoes or beautiful basil, Starter Vegetable Gardens has step-by-step plans to make your dreams come true -- no experience necessary. 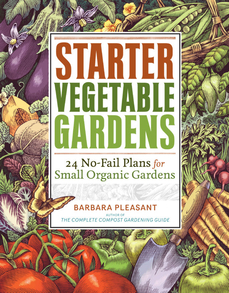 I am a hands-on person who learns best through experience, so it should be no surprise that Starter Vegetable Gardens is a project-oriented gardening book. 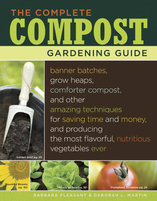 The book's first section illustrates the easiest ever way to begin, which is to plant in bags of soil arranged over your future gardening site. There are also much more complicated Family Food Factory plans for people who want to jump into vegetable gardening in a big way, and need help with crop choices and timing. Please see my Starter Vegetable Gardens page for more information. Do you think compost is boring? Think again! Deb Martin and I thought outside the heap as we wrote The Complete Compost Gardening Guide, because compost project need not be hidden in a back corner of the yard. 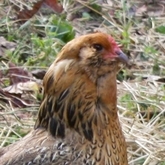 We point out over and over again that what goes on under and around a compost pile is as important as what happens inside of it, because compost becomes a habitat for creatures that improve soil while we sleep. Instructions are here for running a hot heap, too, and I am proud of the chart on how to best handle different compostable animal manures. At any given time I have three composting projects going in my bit organic garden, and still it is never enough. Maybe if the deer stopped eating the winter grains I planned to compost...Please see my Compost Gardening Guide information page for more on this interesting book. The book list goes on! 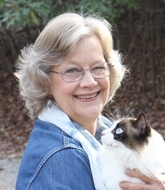 Click here for leads to my older books, a few still in print!